・Sketches, writings and edits from Tarantula, Dylan’s 1965 groundbreaking collection of experimental poetry. ・Dylan lyrics and chord progressions for unrecorded songs, circa 1970. ・Handwritten notes from Dylan and director Howard Alk, detailing editing notes and shot selects from the films Eat The Document (1971) and Renaldo And Clara (1978). 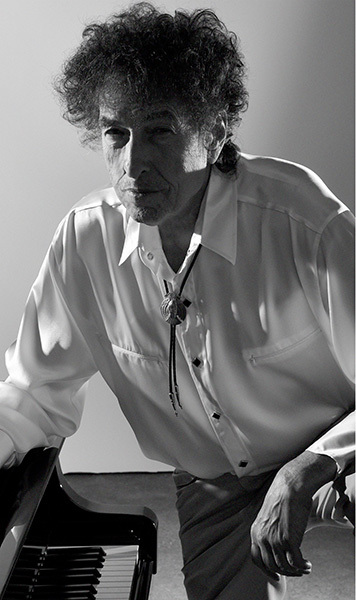 ・Dylan’s 1962 signed contract with Witmark Music, his first music publisher. ・Dylan’s 1966 wallet containing numerous inserts, including paper with Johnny Cash’s address and phone number, as well as a business card from Otis Redding. ・Complete, never-released Dylan concert films from Toronto’s Massey Hall in 1980 and New York’s Supper Club from 1993. ・Dylan’s earliest music recordings from 1959. ・Lyrics to “Chimes Of Freedom,” handwritten by Dylan in 1964 on hotel stationary, complete with annotations and additional verses. ・In-progress and final lyrics to all songs from Dylan’s latter-day masterpiece, Time Out Of Mind, handwritten and annotated by the artist.